Hello there! Welcome to my blog – let’s talk parenting, marriage, recipes, and more! I am a wife to a hard working man, a mother to three wild boys and have been offering childcare out of my home for 10+ years now! Note: Affiliate links may be used in this post. I may receive a small commission at no extra cost to you if you make a purchase through my affiliate link. I promise to only recommend products I truly love! Can you believe that it is Easter time already? It feels like 2019 just started in my eyes. I can’t believe we are now discussing Easter plans and the summer is coming up quickly. 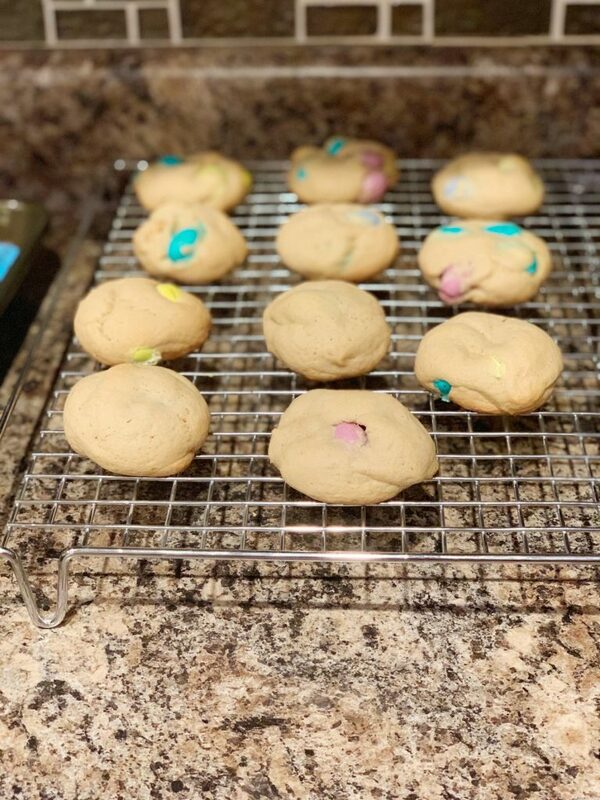 With the Easter season approaching, I decided to whip together some delicious Easter Egg M&M cookies for the family and wanted to share the recipe with all my readers! If you haven’t tried cookies with cornstarch included in the ingredients, you definitely want to attempt some one day. They will change your life, and it makes a world of difference. These cookies call for the “Easter Egg” speckled bag of M&M’s they sell at most convenient stores or grocery stores in the Easter section. You can use regular ones or even the pastels to make them, but I loved the look and taste of the egg ones instead. I want to give you a fair warning about this dough, you will need to refrigerate it for a good two hours before baking, and I know that can sort of be a pain at times. Trust me when I say it is worth it in the end because they are the softest and most delicious cookies I have ever tasted. Deliciously soft cookies with an Easter touch. Combine butter, sugars, egg, vanilla, and beat on medium-high until well creamed. After the sugars are a creamy consistency add in the flour, cornstarch, baking soda, and mix until combined with a spoon. Add in M&M's and fold them in carefully with the mixture until it seems like they are spread out evenly throughout the batter. Create 2 inch balls with the batter and place on a large plate. You will need to flatten them down slightly. Cover the plate with plastic wrap and put in the fridge for a total of 2 hours at the minimum. If you don't want to bake them right away you can store them in a container for up to 5 days in the fridge. Do NOT bake with warm dough. Preheat oven to 350F, line the cookie sheet with silicone mats, parchment paper or cooking spray. Place the pre-made balls on the cookie sheet with at least 2 inches apart. Bake for 10 minutes - they may look uncooked but they will firm up as you let them cool. Let the cookies cool on the baking sheet for 5 minutes before removing them to a cookie rack. Once cookies have cooled completely store them in an airtight container at room temperature for one week. If you currently do not own the silicone baking mats – I highly recommend getting a set because honestly, they are amazing, easy to clean, and I feel like my cookies come out SO much better. They are fairly inexpensive so that part is fantastic! I am going to put a couple of links below so you can check them out if you do decide to get a few. If you get a chance to make these cookies, leave a comment below to let me know how they turned out and if you love them just as much as me!